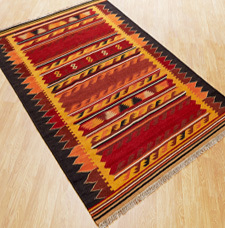 The Caucasian collection features a range of distinct traditional Kelim rugs. The rugs are flat-woven in a special way to produce a reversible two-sided effect, which means each rug can be used on both sides. The Caucasian rugs are very thin and contain no pile resulting in a tapestry-like appearance. Furthermore, the addition of antique fringes also enhances the authentic look this collection. Fabric: 100% Argentinean & New Zealand Wool.